James H. asks: Curious question for you, but something I’ve always wondered about. Why did Yankee Doodle call the feather in his hat macaroni? While silly and irreverent, the song “Yankee Doodle” holds a rather patriotic place in many American hearts and is even the official state song of Connecticut. Today, the jingle may bring to mind a proud revolutionary spirit, but the song’s origins are really anything but. The tune was originally used by British soldiers to mock Americans for being disorganized, disheveled and, as far as the Brits were concerned, inferior. By the end of the American Revolution, however, the song had been repurposed by the burgeoning new country. Here now is the story behind the song “Yankee Doodle” and the answer to that elusive question – Why did Yankee Doodle stick a feather in his cap and call it macaroni? As with a lot of older songs, the tune and music that we today associate with “Yankee Doodle” was actually written much earlier than the 18th century. The melody may have been heard as early as the 1500s in Holland, with rather nonsensical lyrics about the harvest and farmers receiving their wage in buttermilk. Much like the origin of the melody, where the well-known lyrics came from is also not definitively known. One popular theory is that similar lyrics were first used to make fun of Oliver Cromwell, the 17th century English political and military leader, for fancying himself a fashionable person. The purported lyrics are sometimes said to have begun “Yankee doodle come to town, upon on a Kentish pony.” However, this seems unlikely considering the word “Yankee” didn’t come along until years after Cromwell, with the first known documented instance appearing in 1683- used by Dutch settlers in New Amsterdam (today’s New York) to disparage their English colonist neighbors in Connecticut. The first known documented instance of the tune and the words “Yankee” and “doodle dandy” being put together in the same song, it seems, was around the 1750s during the French and Indian War. Prior to fighting for their independence against the British, the colonists were, of course, subjects of the English. Therefore, when the French and Brits went to war over territories in the New World in 1753, the colonists were recruited to join in on the English side. Whoever really wrote it, by 1768, the Boston Journal of the Times noted that the British were playing “that ‘Yankee Doodle’ song,” though the Times didn’t elaborate on what the lyrics were to this version. At this point, the song was constantly being remixed with slightly different lyrics, tunes and meanings, as was common for pretty much all popular songs at the time. Historians aren’t completely sure when the verse about sticking “a feather in his hat and calling it macaroni” came to be. The oldest known print version of this didn’t appear until all the way in 1842, published in London in the book The Nursery Rhymes of England by James Orchard Halliwell, though this particular lyric is obviously thought to date back to the American Revolution, partially due to the term being used here, which dates it somewhat, and how mocking the use of it was. Back to the related term “macaroni”- this term pertains to the habit of rich 18th century English men going on so-called “Grand Tours.” Sort of like the more modern “gap year,” young adult men who could afford it would take long trips around Europe, learning about the culture, art and history of neighboring countries. Particularly those from “new money” would sometimes come back with more refined tastes – like an appreciation for French art, fancy exotic clothes and Italian food. These individuals’ often over the top attempts at trying to appear refined upon their return- speaking a mix of Latin and English and wearing foppish attire complete with massive “Macaroni” wigs and not one, but two pocket watches- were occasionally mocked for this. One of the nicknames they were given at this time was “macaronis.” The individuals were also considered to be part of the informal “Macaroni Club” and would refer to flamboyant fashion and the like as “very macaroni.” As for the origin of the term itself, it is presumed to originally derive from the fact that macaroni was a relatively exotic food for the British and must have been something at least some of these individuals raved about upon their return to England. There is indeed a kind of animal, neither male nor female, a thing of the neuter gender, lately started up among us. It is called a macaroni. It talks without meaning, it smiles without pleasantry, it eats without appetite, it rides without exercise, it wenches without passion. 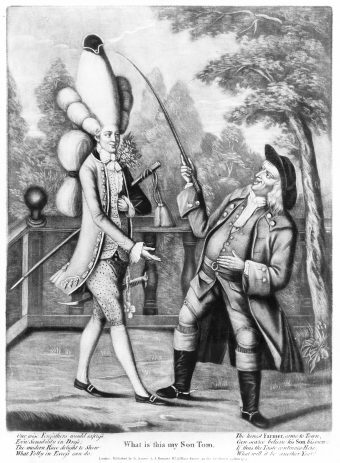 In other words, when the particular lyrics “stuck a feather in his cap and called it macaroni” were added to the Yankee Doodle song, the author was essentially saying that colonists were such low class, moronic fools that they thought by sticking a simple feather in their hat, they were being extremely refined and fashionable. In the end, there were possibly even hundreds of versions of Yankee Doodle in popular circulation during the American Revolution, some initially used by the British to mock their rebellious subjects. In turn, the Americans embraced the song, creating countless versions of their own and other times simply taking pride in the lyrics which were supposed to be mocking. 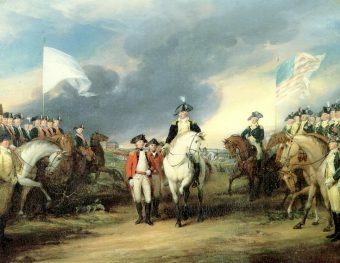 This brings us to October 19, 1781 when General Cornwallis formally surrendered to American and French forces at Yorktown, Virginia. Legend has it that, as a way to mock the defeated troops, famed French commandeer and hero of the American Revolution Marquis de Lafayette ordered the band to play “Yankee Doodle,” with the victorious soldiers singing along.